Tapai is a kind of rice wine native to Sabah where I was born. It is usually cooked with chicken and is popularly eaten during the month long post-childbirth confinement period. It is said to help with blood circulation and ease bloating or wind in the stomach. I learned to cook tapai chicken from mom who makes it for dinner regularly due to high demand. Lots of ginger is usually added into the dish. However, I've decided to do it a little differently this time. I'm going for a pork dish. If you're wondering what this dish will taste like, imagine sweet wine in pork gravy. This is how I did it. Take a look at the recipe below. 2) Add garlic/onion - fry. Add tapai and water - simmer. 3) 10 minutes in, add black fungus. 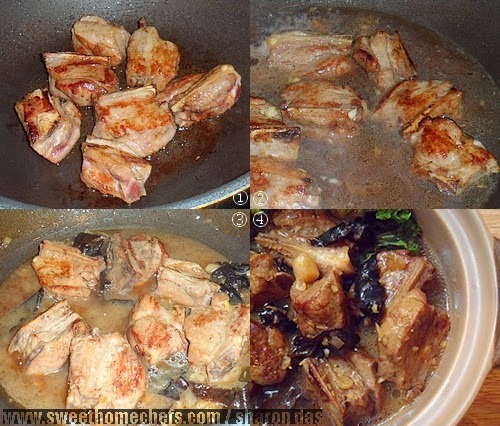 1) Marinate pork ribs in light and dark soy sauce. Leave aside for 30 minutes. 2) After 30 minutes, heat oil in non-stick cooking pot / wok (Don't use a lot of oil). Add pork. Let it fry and turn occasionally. The goal is to brown it on all sides, not cook it thoroughly. 3) Once browned, add garlic and onions into the same pot. Stir-fry it for a bit. Then, add half cup tapai, some water (1 cup or more). Season with a pinch of salt and pepper, followed by a teaspoon of brown sugar. Stir well. 4) Simmer covered for about half an hour on low heat until meat is just tender. Add black fungus 10 minutes into simmer time. 5) Serve with fresh lettuce and eat with rice. Oh oh oh I want some for my tummy! Oops..it's also known as wood ear fungus or cloud ears. Let me edit that to include a link. If I can't get either of those, what do you think of porcini - will that do it? I've not tried porcini but I'm guessing that it will add a more mushroomy flavour to the dish. This is so interesting, Sharon. 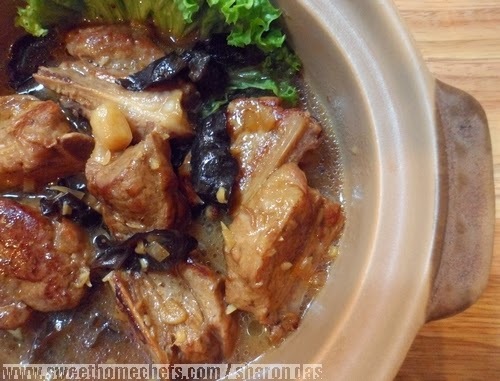 We are pork lovers and we love our rice wine too but somehow our ancestors have not teamed up the two in a pot! I'd love to try this out! It's a good combination. Slurpily good! I don’t even know what to say, why isn’t this on my dinner menu today? Yummy! This looks too good, Sharon!